J. Becher & Associates has wired over 10,000 homes and businesses in Minnesota during its 30 year history. This company’s business is technology and wiring and thus they are demanding on the technology solutions they purchase. When Nick Larsen was given responsibility for warehouse operations he was concerned that there was no electronic tool inventory system. They had a delivery guy who moved tools from job to job as needed and he kept a log book. However, the log book was never accurate because once the tools were dropped at a job they were then outside the control of the warehouse. Employees would move tools from job to job for all the right reasons. They were trying to get work done quickly and would just grab what they needed from the closest technician. Unfortunately, this led to not being able to find things without “a bunch of phone calls and people chasing their tails around” looking for things. Without knowing where things were, Nick could not control the spending on tools. “We were hand over fist buying stuff because we didn’t know who had what,” said Nick. People knew they were supposed to keep track of things but it wasn’t part of the daily process, so when business got hectic the tracking went by the wayside. 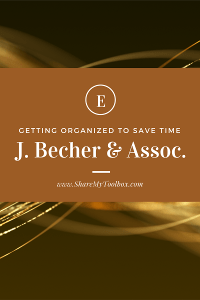 When the owner of J Becher saw ShareMyToolbox at the NECA National Convention in Boston he knew it was the right solution for his company. He knew that it would be hard to push an agenda out from the office to the field. The key to ShareMyToolbox working is that it benefited the field first. Focusing on the field first was the key to getting it adopted and accepted. This is what made ShareMyToolbox different from other tool tracking systems and it was just what his company needed. What was the biggest surprise when setting up the system? What advice would you give other companies considering a system? Why did you invest time in putting this system in place? How did you justify the cost for a tool tracking system?